This is a great trek for people with experience as well as for beginners looking to stretch themselves. It has just one slightly difficult day, the day you cross the pass where one would need to exert a bit more than the other days. On this trek you move from one state (Uttarakhand) to the other (Himachal) it is no wonder that there is lots of variety on offer. One gets to appreciate the different landscapes and culture of the Rupin valley towards Uttarakhand and Sangla valley in Himachal. 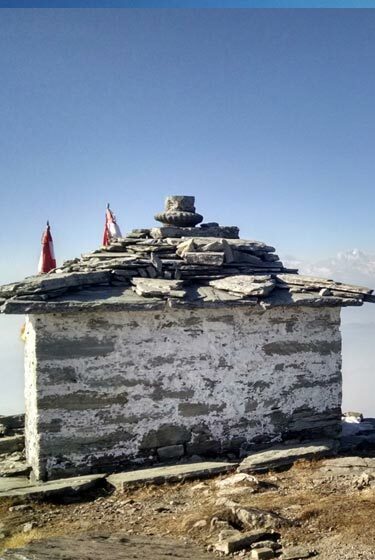 There is a special flavour to this trek – The trail has sections which take you through remote villages giving you a wonderful experience of looking at a completely different way of life. Also you get enough opportunities to interact with locals and shepherds who move around on the endless meadows along the trail. 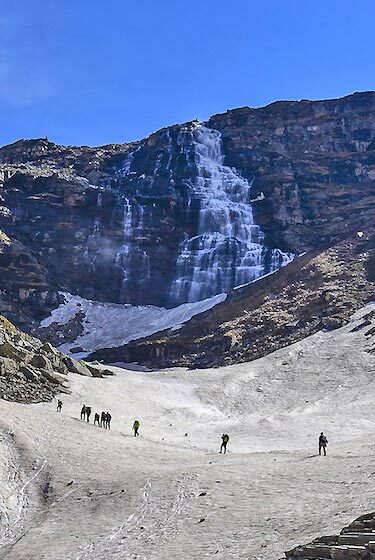 The highlight of this trek would surely be scaling the Rupin Pass, a beautiful high altitude Himalayan pass at 4600m. Usually this is a not a very difficult pass to negotiate but at times, depending upon the snow conditions it can pose quite a challenge. The landscape on both sides of the pass is spectacular and star studded with waterfalls, lush green meadows, snow-capped mountains, quaint villages and big rivers. Basically it has something to offer to everyone walking the trail. Something you are guaranteed to enjoy on this trek is the camping experience with campsites that are wonderfully located with great views all around. All group members to meet at Dehradun railway station at 7:00 a.m. and from here we will board a vehicle and be driven up to Mori, a small and extremely scenic village settled on the banks of the beautiful Tons river. The drive today is quite interesting. After Mori we continue to drive through a pine forest along the Tons river to reach Netwar where we visit the ancient temple of Pokhu Devta. The architecture of the temple is very unique and typical of the region. From here we drive further to reach the village at Dhaula, which is situated by the Rupin gad. This is the start point of the trek Overnight in tents. From Dhaula the walk is mostly through rhododendron forest and fields. After a few hours of hiking we will reach our destination for the day, Sewa. Overnight in tents. Today the trail is quite interesting. We will get the opportunity to get a close look at the local culture and the way of life of the people living here as we pass by a few villages. We pass through mixed forests and also get our first views of the snow-capped ridges of the Dhauladhar range. The village at Jakha is the last village on the trail and also the highest in the area. Overnight in tents. Our destination for the day is the beautiful meadows at Suruwas Thach. We will initially walk along the river before climbing through a forest section to reach the entrance of the Rupin Valley. We will also get the first view of the Rupin waterfall from here. The meadows at Suruwas Thach are very refreshing and ideal for camping. Overnight in tents. 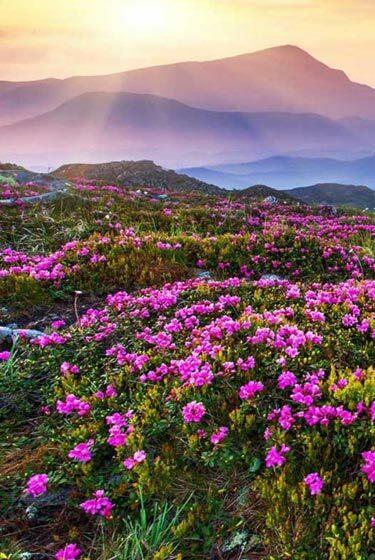 This stage of the trek is full of wonders; you will relish each step you walk. Initial climb will take us to a picture perfect meadow. We spend some time here taking pictures and a short rest. From it’s a steep walk through rock cliff and possible snow patches until we reach the upper waterfall campsite, surely one of the finest meadows in this part of the world. Overnight in tents. Today you give your body some rest and relax in the beautiful environs. This rest day will ensure that you have a fully charged battery when you set out for the pass next day. Also for the restless kind, there is a possibility to do some exploration close to the campsite. Overnight in tents. We start early today. It’s a challenging stage requiring one to climb up snowfields and one rocky gully to the pass. Depending upon conditions we might need to rope up in a few patches. The climb to the pass will take about 4-6 hours depending upon the snow conditions. From the pass we you are rewarded with a fine panorama of the Himalayas. 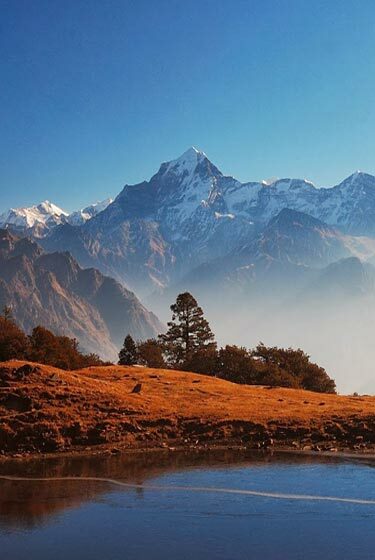 We get to see the peaks of Kinner Kailash range and the ones close to Charang La. Having rested our bodies and feasted on some great sights it’s time to descend. We walk for a couple of hours to reach the pastures at Ronti Gad. Welcome to the meadows of Kinnaur! Overnight in tents. It’s a long descent down to Sangla. Your knees are surely going to complain at the end of it. But one is again rewarded with some fantastic sights along the way. 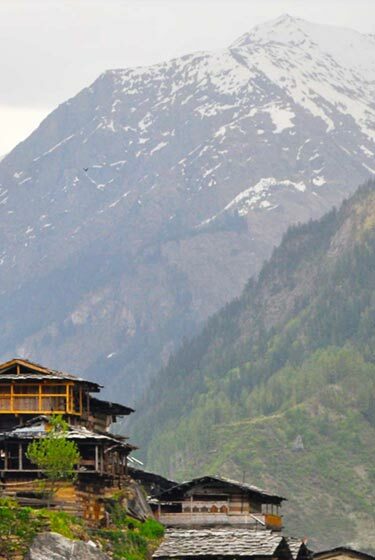 The Kinner Kailash range makes its presence felt very evidently while the villages of the Sangla valley spread all over create a nice picture. We are towards the end welcomed by the Baspa river into its valley. First thing you look out for on reaching Sangla - is a place to sit and a cup of hot masala tea. Overnight in a hotel/camp. After an early breakfast get into the waiting vehicle and drive towards Shimla. It’s a beautiful drive for the day. Reach Shimla towards afternoon and proceed towards your onward destination. Trip ends here. 2 guides for the group of maximum 12 trekkers so 1 guide for 6 group members. This will ensure high safety and more information and personal attention which are necessary to appreciate a trek. All our guides are professionally trained and have many years of relevant experience in guiding treks. Do keep in mind that transport is a very critical component of your trek. This aspect is most often not given proper attention and can result in lot of discomfort especially in the mountains. We provide transfers to get you to the starting point and back as comfortably and in as less time as possible for you to enjoy the trip. We only use quality vehicles like Toyota Innova, Mahindra Xylo, Mahindra Scorpio, Tempo Traveller, etc. and no local jeeps or similar vehicles are used except where there are short transfers to the start points and from end points. The transport tariff includes all driver charges, fuel, parking, toll and taxes. For travel to Dehradun one can choose between air, rail & road. For air travel, the closest airport is the Jolly Grant Airport (at Dehradun) and is well connected to Delhi and other parts of the country by Air India, Jet Airways, Kingfisher Airlines & Spice Jet. Train travel is highly recommended with enough options being there. For train details, you could log on to www.indianrail.gov.in and for online railway ticket bookings you could log on to www.irctc.co.in . There are frequent Public Transport buses including Volvos available from Delhi to Dehradun that cost about Rs. 200-500 per person. These buses depart from Delhi ISBT every 30 mins. or so and take about 7 hrs to cover the distance. A private vehicle could also be arranged for if you require the same. There is good service of buses from Shimla to Chandigarh. For travel from Chandigarh to Delhi one can choose between air, rail & road. For air travel, the closest airport is the Chandigarh Airport and is well connected to Delhi and other parts of the country by Air India, Jet Airways & Spice Jet. Train travel is highly recommended with enough options being there. For train details, you could log on to www.indianrail.gov.in and for online railway ticket bookings you could log on to www.irctc.co.in . There are frequent Public Transport buses including Volvos available from Chandigarh to Delhi that cost about Rs. 200-700 per person. They take about 5 hrs to cover the distance. A private vehicle could also be arranged for if you require the same. In the initial days of the pre monsoon season (May-Jun) there might be lots of snow even below the pass along the trail which generally melts by mid-June. Days are going to be sunny and warm (14-22 °C) while the night temperature at the highest campsite would be in the range of 0-8 °C. In the post monsoon season (Sep-Oct) there is possibility of snow towards the end of the season, which also melts very fast. The days are sunny with temperatures hovering around (12-20 °C) and the evenings start getting cold with the onset of October and nights are comparatively colder (- 4 to 5 °C).